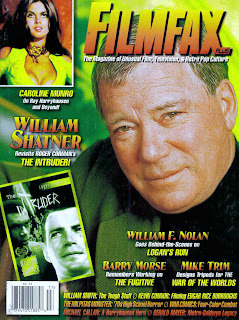 Hey everyone, the new issue of Filmfax features my interview with legendary Brit director Kevin Connor (From Beyond the Grave , The Land That Time Forgot , At the Earth's Core , etc.) and is now on sale at bookstores near you. There's a lot of terrific stuff in this issue, including an interview with the immortal Shat on Roger Corman's Intruder, an interview with the late, great Barry Morse on The Fugitive, and an illuminating piece on William F. Nolan and one of my all time favorites, Logan's Run. There's even an interview with At the Earth's Core gorgeous starlet Caroline Munro. Check it out! Wow, looks like a lot of great stuff in the new issue! I've always had a soft spot for Kevin Connor's Amicus pictures (they were a staple of many Saturday afternoon creature-features back in the 80's). I hope he commented on his Space:1999 episode too. A Barry Morse tribute is well deserved. He was such a class act. I've been following the series of articles on Mike Trim. They inspired me to purchase his new book of art...what a pleasure (and not just for Gerry Anderson fans). His production art work is stunning!